Architects’ Houses by Los Angeles-based writer Michael Webb foregrounds 30 of the design world’s most prominent figures, including Norman Foster, Todd Williams and Billie Tsien. With a special focus on the houses that designers have built for themselves, Webb explores a variety of creative processes, whilst interweaving history over the last 200 years, from Charles and Ray Eames’ first post-war Case Study House to Frank Lloyd Wright’s modernist home, Taliesin. Webb’s question, “how can a house enrich lives and its natural surroundings?” is looked at through the lens of both functionality and aesthetics. Drawing on a multitude of texts, sketches and plans, he examines the importance of practicality and restriction. The home of Polish architect Robert Konieczny, for instance, is situated on a sloping meadow in the hills of Brenna, southern Poland, and, as such, is exposed to mudslides. To overcome this, Konieczny raised the structure on three wedges. “Konieczny realised that the solution was not to challenge nature but to go with the flow,” says Webb. In contrast, South African architect Jennifer Beningfield’s Swartberg House is described as a “tabula rasa that allowed almost unlimited creative freedom.” Composed of several white volumes that are covered in a rough stucco surface, the project plays against its surroundings whilst casting shadows to protect against sunlight. “The house has realised all of Beningfield’s goals whilst also addressing the practical concerns of her husband, who, having worked in the office of Foster + Partners, played the role of the critic,” Webb explains. The home as a manifesto is another central theme. “Houses can be a statement of principles and a practical demonstration of architectural talent,” Webb begins. “They can be radical manifestos or prototypes.” He points out Chile-based practice Pezo von Ellrichshausen’s geometric façades as an example of this. Much like the studio’s broader work, the Cien residence builds upwards, rejecting conventional notions of comfort. “They’ve built two rough-edged concrete towers for themselves, one in the city of Concepcion, Chile, another on the Pacific coast, and both are frugal exercises in spatial geometry and materiality,” Webb says. Elsewhere, Antón García-Abril’s monumental Steinhaus pays homage to a love of the mountainous landscape from Abril’s childhood. Composed of three steel pods, the sharply faceted construction appears like an extension of the mountains and the rock faces surrounding it. Webb notes: “Whether the house was the source of his growth as an architect, or only a metaphor for that process, it is likely to be seen as his monument.” The vast range of buildings featured in this publication are not only responses to the surrounding environments but also reflections of the people who built them. On Webb’s reading, the house is a mirror that reflects all these notions: the personal, the practical, the ideological and the aesthetic. Architects’ Houses is published by Thames & Hudson. Find out more here. 1. Swartberg House, Prince Albert, South Africa (Jennifer Benningfield). Simple blocks of brick faced in rough plaster play off the beauty of the landscape. Image credit: Richard Davies, courtesy Openstudio Architects. 2. 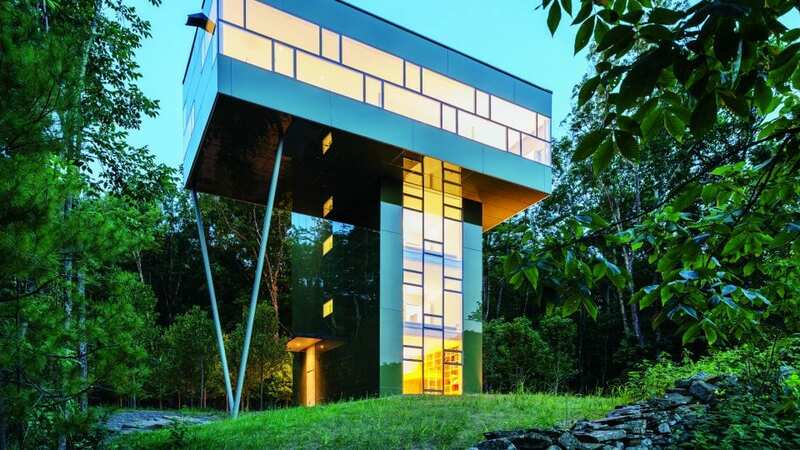 Tower house, Ulster County, New York State (Peter and Thomas GluckLiving spaces are cantilevered from a stack of three bedrooms to command sweeping views over the tree tops. Image credit: Paul Warchol Photography. Combining unprecedented technologies with traditional techniques, Lucy Johnston navigates the future of design through compromise & innovation.